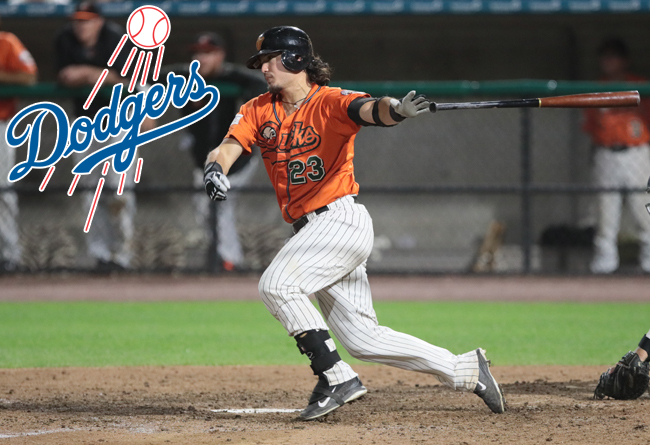 (Central Islip, N.Y., Feb. 18, 2018) – The Long Island Ducks today announced that catcher Alex Burg has been signed by the Los Angeles Dodgers organization. He will report to the team’s spring training facility in Glendale, Ariz.
Burg signed with the Ducks for the 2018 season on February 1. He played 114 games for Long Island in 2017, totaling 12 home runs, 42 runs batted in, 48 runs scored and 20 doubles. Defensively, the Washington native ranked second in the Atlantic League among catchers in games played (98), assists (64) and putouts (697). For his efforts, he was selected to represent the Liberty Division at the 20th Annual Atlantic League All-Star Game. Burg went on to lead the Flock with a .348 batting average (8-for-23) in the postseason, adding two homers, three RBI, five runs and four walks to help Long Island earn its second consecutive Liberty Division Championship. The 30-year-old will return to a Major League organization after splitting time over the first seven seasons of his career in the San Francisco Giants, Miami Marlins and Texas Rangers’ systems. He was named a California League Mid-Season All-Star in 2015, batting .302 with 15 homers and 43 RBI in 57 games with High Desert (A+, Rangers). The Washington State University alum also spent time at Double-A and Triple-A that year, combining to post career-high totals in home runs (22), RBI (65), runs (71), hits (111), walks (64) and games played (112). Burg was originally drafted by the Giants in the 24th round of the 2009 amateur draft. Burg becomes the second member of the 2017 Ducks roster to be signed by an MLB club this offseason. He joins fellow-catcher Jordan Pacheco, who inked a contract with the Minnesota Twins on January 8. Four Ducks players had their contracts purchased by Major League or foreign professional clubs in 2017, including a franchise-record three that returned to the MLB level. They included pitchers Tim Melville (Twins, Padres) and Henderson Alvarez (Phillies) along with outfielder Quintin Berry (Brewers).